The antitragus is a feature of mammalian ear anatomy. 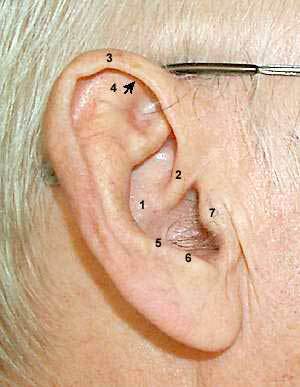 In humans, it is a small tubercle on the visible part of the ear; the pinna. The antitragus is located just above the earlobe and points anteriorly. 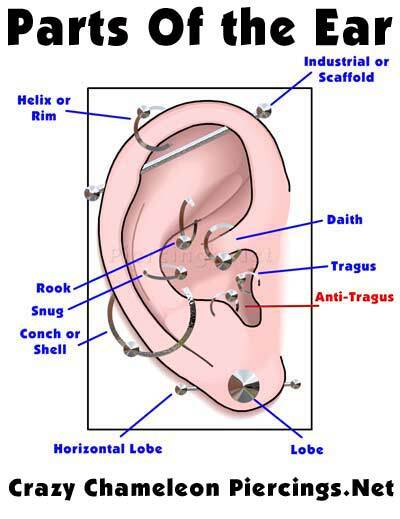 It is separated from the tragus by the intertragic notch. 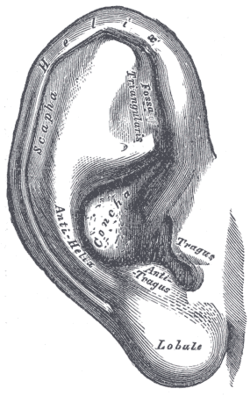 The antitragicus muscle, an intrinsic muscle of the ear, arises from the outer part of the antitragus. The antitragus can be much larger in some other species, most notably bats. The muscles of the auricula. External ear. Right auricle.Lateral view. ^ "Antitragus". AnatomyExpert. Archived from the original on 10 May 2013. Retrieved 9 March 2013. ^ "Henry Gray (1825–1861). Anatomy of the Human Body. 1918". Bartleby.com. Retrieved 9 March 2013.